I could not agree more. Arsenio was the very best, except for the god of late night, Tom Snyder, who will always reign at least in my mind. Snyder and his famous lilting laugh. Or it was more like a guffaw. He really was a purist, insofar as needing no props or gimmicks or noise. Just one on one chat. In that regard, he was certainly a trailblazer for Charlie Rose. Snyder passed away a couple years ago, sadly. I think Arsenio has continued to do stand-up, and possibly a few more small movie parts (he had at least one major one that I can remember, opposite Eddie Murphy in "Coming to America." If anyone wants to do any quick web research and post a link or two about Arsenio's recent work, please do. 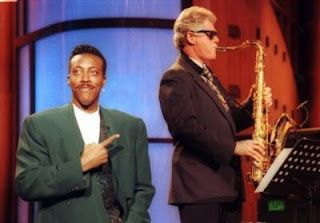 Funny you should suggest that, as I had already gone there wondering, "whatever happened to Arsenio Hall"? Thanks, Kim! I'm buried today up to my eyeballs in deadlines for website copy about student loans, or I would have done that myself. I really appreciate your pitching in.